My production time is 2 weeks, until a made-to-order item ships. Standard shipping takes ~ 3-5 business days. You may choose to upgrade to Priority Shipping (1-3 business days) at checkout, however my production time still applies. ▶ You will receive either a WHITE or BLACK ring sizer, depending on what the manufacturer sends. They both work the same way. 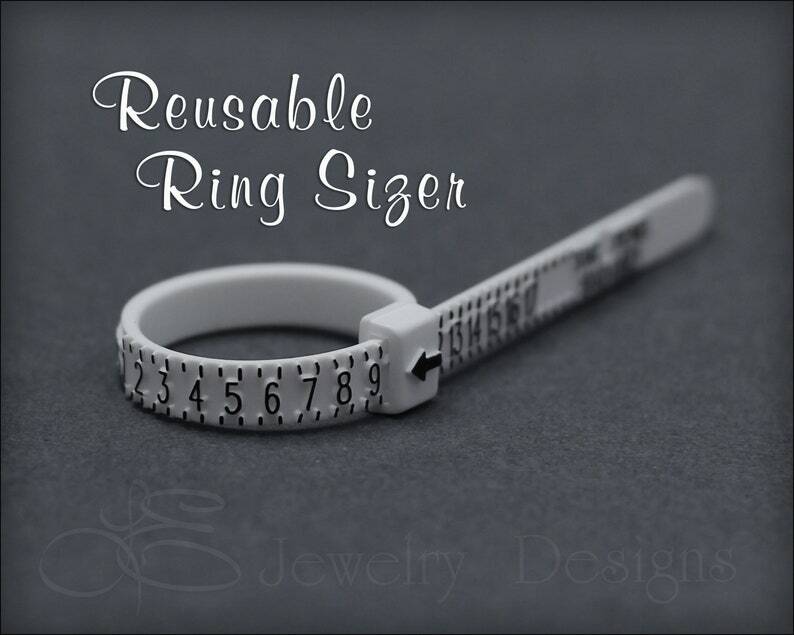 Find your ring size with this handy ring sizer! Since it works similar to a belt, put the end through the loop, slide over finger and tighten until it fits. Repeatedly slide over knuckle and adjust to ensure the correct fit. The arrow points to your size. You may also refer to the instructions on the package. ▶ PLEASE NOTE: This sizer is reusable, so keep it with your jewelry or on your person. Ring sizes can change due to weather changes and other variables, so you will always be able to find your size. This item ships via ▶ FIRST CLASS MAIL with tracking info. If you'd like it shipped faster ▶ (PRIORITY MAIL), please choose the shipping upgrade, when checking out. Shipping upgrade is NOT available if you purchase a made-to-order item at the same time as the ring sizer.